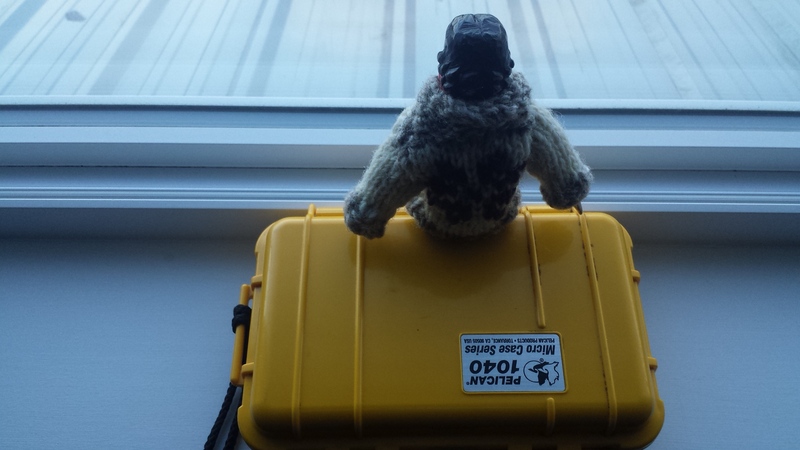 Tansy spent an unexpected night in her travel case as her favourite photographer’s connecting flight to Haida Gwaii was missed due to bad weather in Victoria. 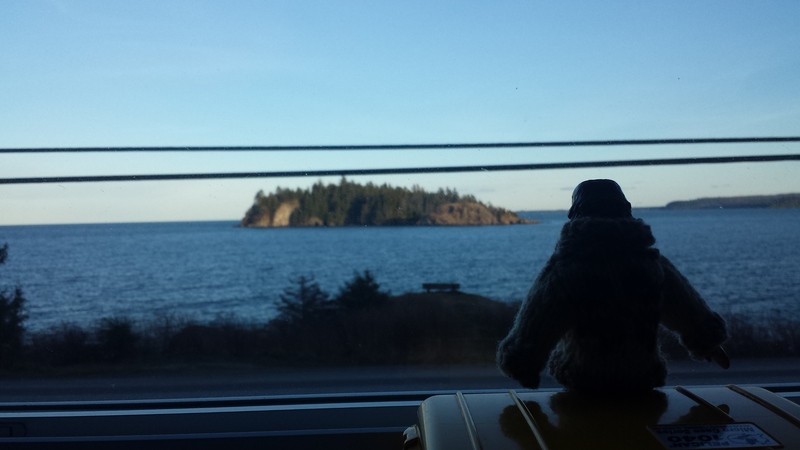 At last the two of them arrived, at the airport in Sandspit, and took a shuttle to Jags Beanstalk – one of best places to stay in Skidegate. Jags has Really good food. And great coffee. And they appreciate Tansy who has featured on their FB page! Click here for Jags website! Tansy admired the artwork on the wall, like this print of a work by Gordon Miller. 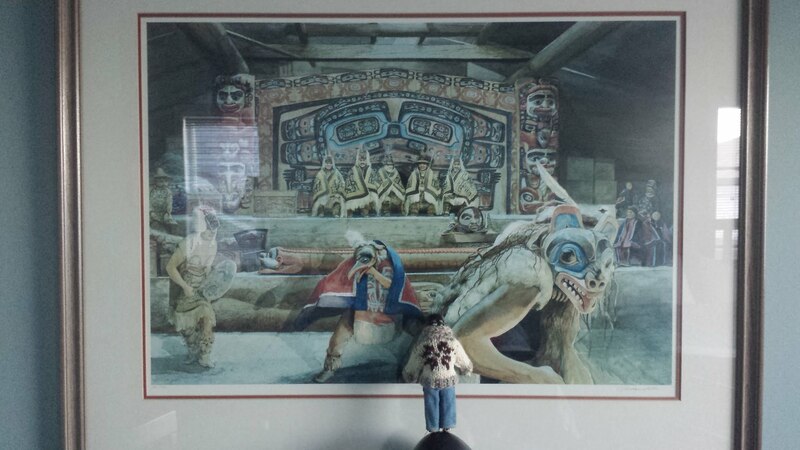 It shows what the interior of a Haida Big House may have looked like during a Potlatch. Please Click here for a link to a CBC video about the making of this film: The Edge of the Knife, and its importance in reconnecting people with the Haida language. It is the first feature film ever made by Haida People in their language. After all that Tansy was ready for bed! 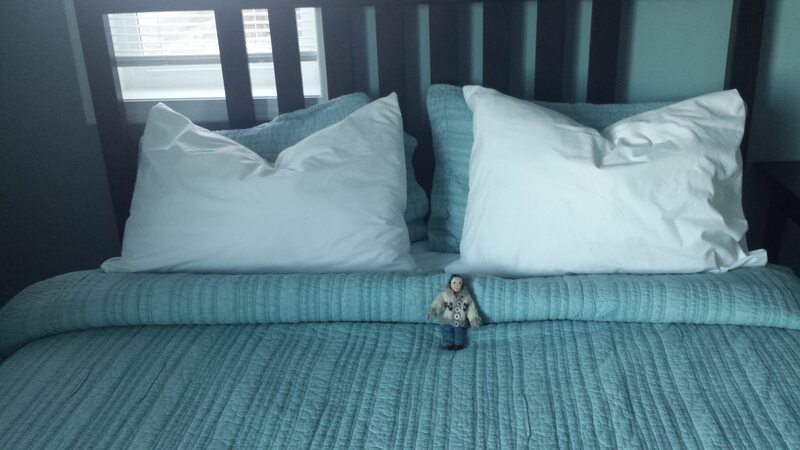 …Jags was very considerate and put them in a room that had one entire bed for Tansy and another for the photographer! 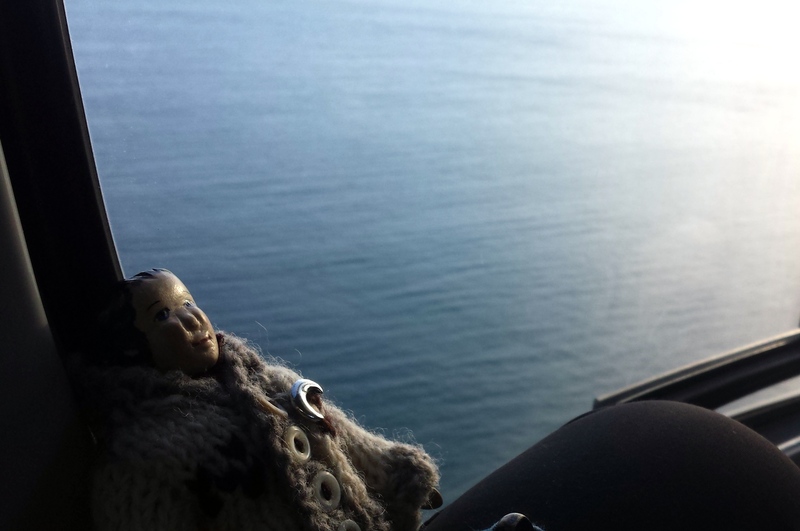 In the morning (after a comfortable sleep and delicious breakfast, and more meetings), Tansy was ready to fly on her first Helicopter ride. The trip south to the site will be fairly quick, but now Tansy and her favourite photographer will be out of contact for at least two weeks, while they are back working at SGang Gwaay. We’ll have to wait and hear how the work went, what the weather was like, and where Tansy got the crescent moon pin that seems to be attached to her sweater! Glad to read that Tansy and Favorite Photographer finally got to their destination after that bumpy start. 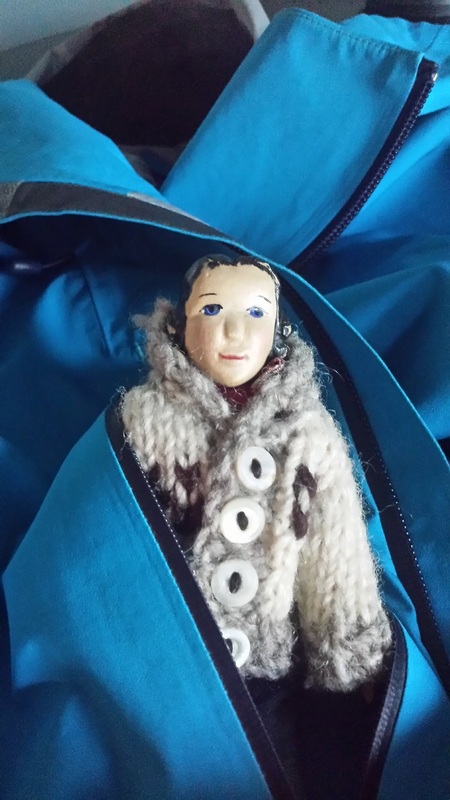 Thankfully, Tansy had her cozy sweater on to keep her toasty warm, while waiting it out, in her suitcase the first night. Loved that they had a good meal and bed at Jags…especially that Tansy is featured on their FB page. Tansy has become quite the celebrity but seems unaware of it and continues to keep focused on the importance of her duties in helping favorite photographer on SGang Gwaay. Tansy is a good sport, and doesn’t let little things like delays and forgotten equipment bother her! She is the best kind of work colleague, positive and hard working…she can hardly wait to get started! Lovely to experience new adventures in familiar territory! Tansy seems to take everything in stride. 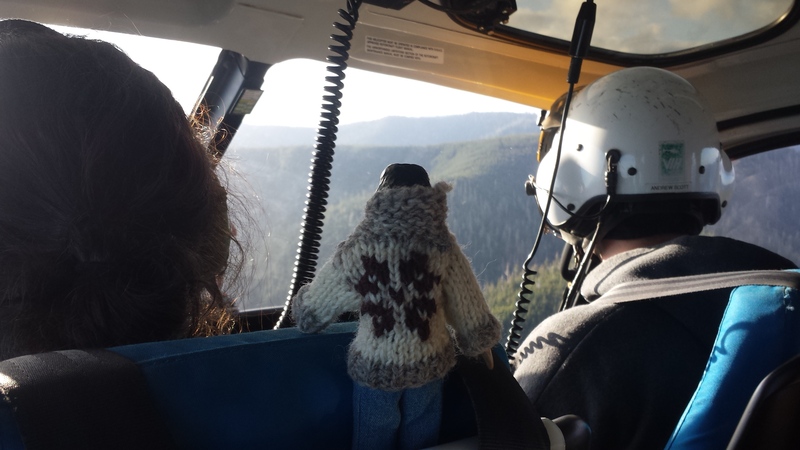 Her cozy new sweater is perfect for this trip. 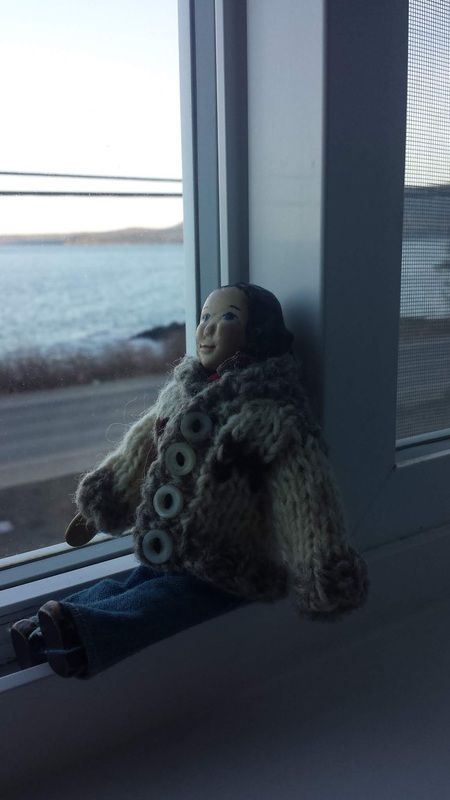 I have a feeling that Tansy will be the warmest Hitty on Haida Gwaii! She does love her sweater! Another excellent adventure for Tansy and her Favorite photographer. Thanks for the link to the film intro. I am off to watch it. Wishing the travelers smooth sailing and good weather. We hope they have good weather too, and a good work trip. Tansy is a very lucky Hitty!